I got a corner cut to go to far on the left..
Maybe if I had braked my car down to 30 km/h both cars would have had a serious chance to overtake in right side of that corner. 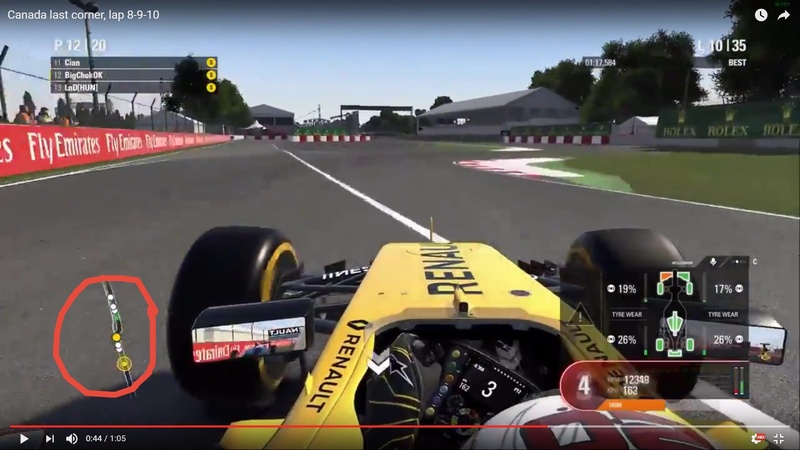 However I will not refuse to learn from this so I will walk through some other drivers vids to see how they did it. I guess you all know me enough now to tell that I am always trying to leave room in a corner. My apologizes if I did this corner different from anybody else. That is what you have to see. You had to cut the corner and push us off the track to get the corner. You don't have to stop in the corner as well, but if you see or know (the indicator helps you) the another car is next to you like the rule write it, you have to be carefull and leave a room for the another driver, because he won't be able to react your move. ( You have to accept you may will be overtaken but it doesn't mean you can't attack back) I think it could be better if you let the another car to overtake you before the corner (in the corner exit he will get a bad acceleration because of the corner entry) and concentrate to get the best acc in the corner exit. In this way you could attack back in the next straight. You always have to think a little bit ahead. I admit the action with @only4win I was going into the corner to fast - I am sorry for that man! I just saw you draw back and thought you wouldn't risk a collision (I would in your situation) but you didn't and I should have seen that. @LnD you sneaked up behind a slower car just before the corner and expect me to be able to see you coming fast at the right side of a 90/90 corner and fight me in that very tight corner - I didn't expect that, sorry, and I can't see it in other ways as a race incident at best. That's okay everybody make mistakes and have to learn, and I don't wanna be a d**k, but just you should see me absolutly clear.The picture what you attached is tricky. The map what you marked in 70% of the races show bad car positions as I recognized from single and online races.